GAZ is the acronym for the Gorkij Avtomobiliy Zavod (Auto Factory in Gorky) which was responsible for producing an indigenous 4x4 utility vehicle for the Soviet Army. The first vehicle was the GAZ-61 in 1938, with newer versions coming along to incorporate engineering improvements. The GAZ-66 is a two-ton 4x4 military truck that was produced between 1964 and 1999 with over 950,000 examples built. The vehicle is simple, easy to maintain, and very reliable. Various enhancements were added during its production run including centralized tire inflation, winch, and power take-off. The chassis also served as the platform for a variety of variants including mounted shelters for field repair, communications, fire engine, etc. There are literally thousands of these trucks still in service today around the world. 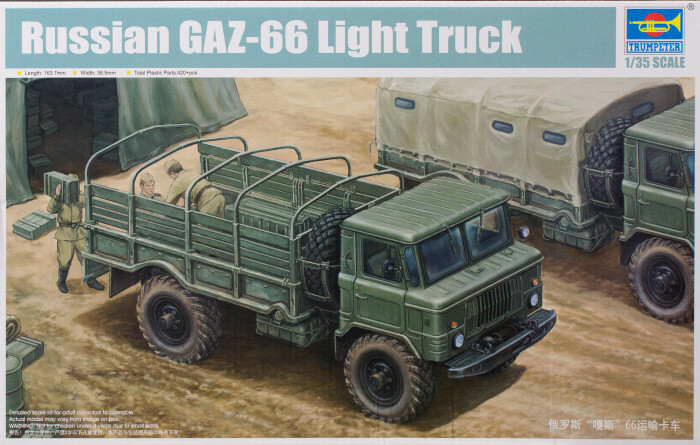 With Trumpeter producing a growing range of military trucks in 1/35 scale, it was only logical for them to tackle one of the most widely produced trucks, the GAZ-66. Molded in light gray styrene, this kit is presented on nine parts trees plus cab shell and canvas bed cover, one tree of clear parts, and three frets of photo-etched parts. According to the specs, there are over 420 parts in this build. This kit is very nicely detailed and is definitely a step up from the only other 1/35 GAZ-66 kit which was produced in Russia under the Eastern Express brand. This is a nicely engineered kit that offers lots of details and options, whether as a standalone truck or as a prime mover for a trailer or light artillery piece. When all of the civilian uses of the GAZ-66, you literally have a world of configurations and paint schemes to choose from using this simple truck kit. You might want to obtain several of these for future projects!